Cyrus managed in relatively no time to establish Persian control over the ancient Near East, Egypt, and parts of India, giving the Greek city-states a run for their money. The Persian Empire was the largest Empire that had ever been established. The Persian Empire spanned from Egypt in the west to Turkey in the north, and through Mesopotamia to the Indus River in the east. Persia is today the country of Iran. By the 5th century B.C.E., it was the largest empire the world had ever seen, surpassing the size of their Assyrian predecessors. 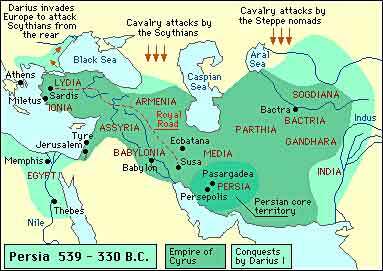 In 539 B.C.E., King Cyrus decided to expand the boundaries of Persia. He began by conquering Babylon. Unlike Assyrian kings, Cyrus was known for his mercy rather than his cruelty. For example, he allowed the Hebrews, who had been captives in Babylon for over fifty years to return to the holy city of Jerusalem, instead of turning them into slaves. He returned sacred items that were stolen from them and allowed the rebuilding of their capital and the temple. Cyrus also allowed the Hebrews to continue living and worshiping as they chose. The Jewish prophet, Isaiah, called Cyrus "God's shepherd," and said that "God would go before him and level the mountains." 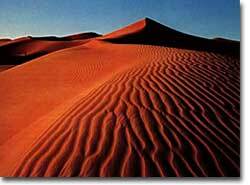 The Empty Quarter is the largest area of continuous sand in the world. 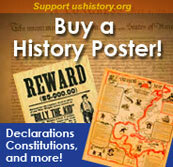 Cyrus's generosity toward the Jews was not an isolated event. He and his successors employed a policy of adaptation and reconciliation toward all of their new subjects. They cooperated with local rulers and interfered as little as possible in matters that did not directly relate to their rule. They respected local traditions and even adopted some of their subjects' religious practices for themselves. The Persian leaders required cooperation and imposed a 20 percent tax on all agriculture and manufacturing. They also taxed religious institutions, which despite their wealth had previously not been taxed. The Persians themselves paid no taxes. The Persian kings — especially Cyrus and, later, Darius I (522-486 B.C.E.) — developed a model for the administration of a large empire that was copied by others in the future. Laws were carried out fairly and evenly among all of the various subject peoples. The Persians divided their empire into 20 provinces that were managed by governors. In addition, they provided land to feudal lords in exchange for loyalty and guarantees of soldiers for the Persian army. Most of the people in the empire, including average Persians, simply remained struggling farmers or craftspeople. Cyrus built the foundations of a courier, or mail, system. Darius I built a communication network that connected most of the empire. A 1,600-mile-long royal road was built from Sardis to Susa, one of the administrative capitals. Along this road, were numerous places for lodging, where royal couriers could obtain fresh horses and supplies. 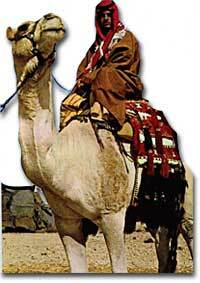 A Bedouin man on a camel wears clothing that shields him from the heat of the hot desert sun. The Persians also developed a religion based on monotheism, the belief in one god. It was founded by the prophet Zoroaster, called Zarathustra in old Iranian. Many of his ideas were collected in a series of poems called the Gathas, which became part of the religion's most sacred book, the Avesta. Zoroaster believed that people were training for a future life. He taught that the earthly world was torn by a constant struggle between good and evil. Humans would have to choose between the two in preparation for a final judgment when good would triumph over evil. When this happened, all earthly existence would disappear. The Zoroastrian god, Ahura Mazda, embodied goodness and wisdom. Some religious scholars believe that Zoroaster's ideas strongly influenced on the development of the Hebrew and Christian religions. Despite the Persians' effective and conciliatory leadership, their empire did not last. Under King Xerxes in 480 B.C.E., the Persians made an attempt to expand their empire into Greece. The Greek city-states cooperated and held off the Persian threat and even succeeded in almost obliterating the Persian navy. When Alexander the Great rose to power in 331 B.C.E., he put an end to Persian dreams of expanding their empire. Only in his early twenties, Alexander had no equal as a military strategist. He swept through the ancient world, conquering all of the Persian Empire. This site is packed with information on the unique style of Persian architecture. Bridges, mosques, minarets, domes, gardens — it's all here. Set aside some time to look at this page; there is a lot here, and it is all fascinating. What if the Statue of Liberty just sunk into the sea and nobody remembered its existence? Or the Eiffel Tower crumbled and no one could remember how all that metal fit together? Well, that's what happened to most of the Seven Wonders of the Ancient World.